The centerpiece of the creation is Allegra‘s torso with some eye stickers on what would be her breasts. 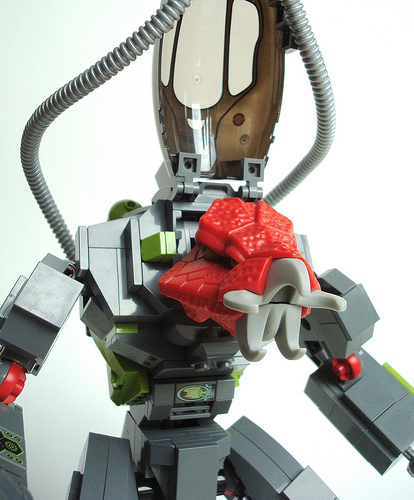 The use of red ball joints as fingertips is inspired already, but the builder went an extra step, using minifig helmets as larger fingertips on the middle fingers. I came into The Brothers Brick contributor gig knowing I would be challenged to find and write about LEGO creations outside of my comfort zone. 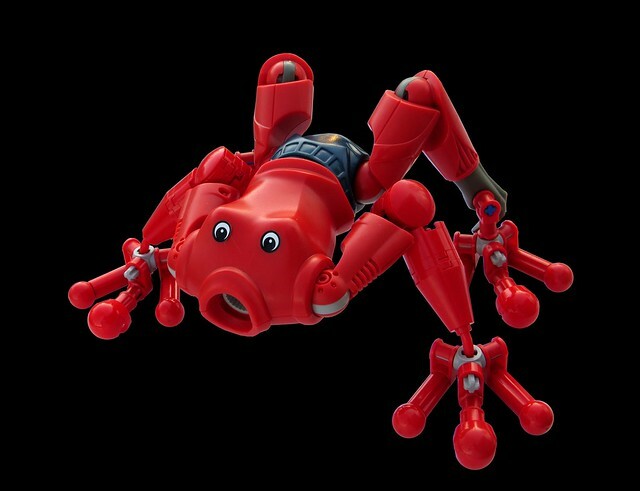 What I didn’t expect was how quickly I would fall down the deep rabbit hole of Bionicle creations, and I keep finding myself drawn to Logey Bear’s works, many of which have been featured on TBB in the past (my favorite being Captain Falcon of Nintendo F-Zero fame). 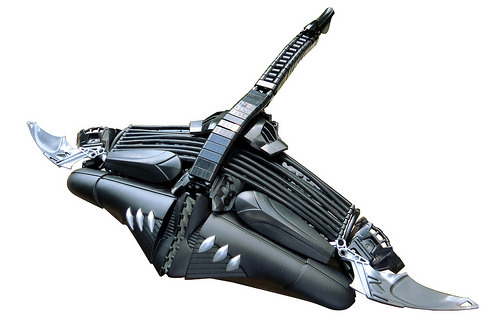 His latest model is an oceanic delight, a Bionicle-Galidor hybrid model that barely registered to me as LEGO at first glance. The key component of this radical ray is the pair of “powerizer legs” comprising the front of the beast. The spinal ridge straight through to the tail is also a slick, organic touch. 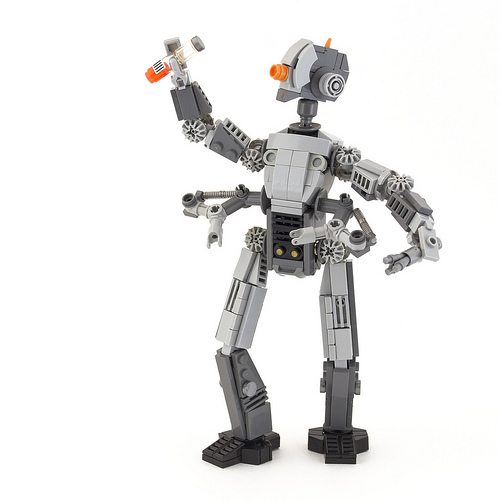 Lately I’ve been a bit obsessed with LEGO’s greatest failure of all time. So much so that my wife has threatened to plan an intervention if I don’t stop. Those fans who have been around for a while know the horror of which I speak. Created by Steve Puckett, this build features the Galidor TDN module as the cockpit of a rather awesome mecha. 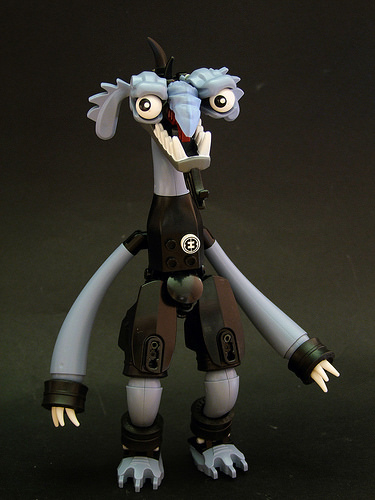 I can’t believe we missed this because I blogged one of his other Galidor-esque creations back in 2008. 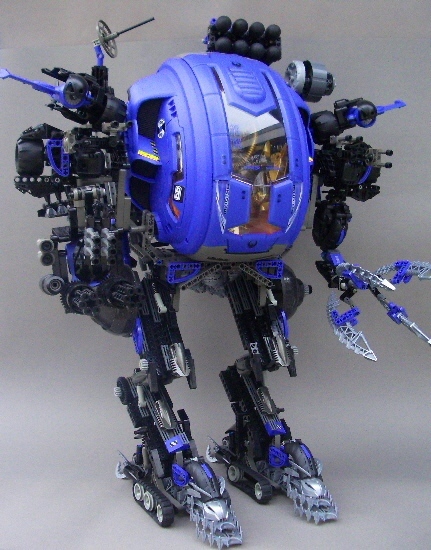 I love the amount of tech that the builder has crammed onto this Mecha and how he has managed to make the juxtaposition of Galidor and real LEGO work. It’s a thing of beauty! Check out the whole gallery of pictures here. We were so proud to show off our building skills in April. Of course, Djordje has to go and one-up us all. This slightly creepy, bushy-eyebrow’d fellow looks like he belongs in the world of what Galidor should have been. In all seriousness, this guy has character. He looks like he’s plotting someone’s terrible demise with those old dinosaur-head-eyes. I’m not quite sure if he belongs squarely with other aliens or if he’d be more at home in The Labyrinth. I’ll leave that decision to you. 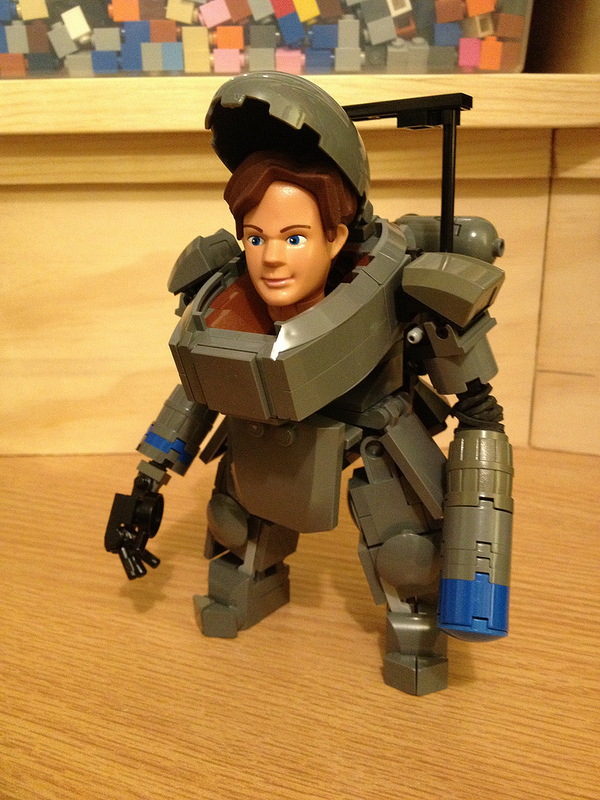 Angus MacLane (MacLane) brings us an awesome hardsuit, with a Galidor twist. 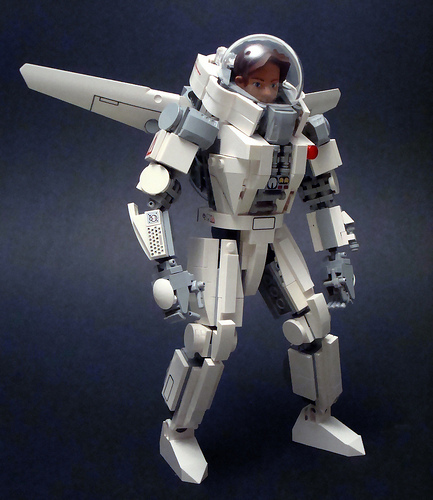 He’s combined a great model with one of the worst things ever made by Lego. When he hears that Galidor was canceled, he’ll be crying himself to sleep on his colossal pillow. 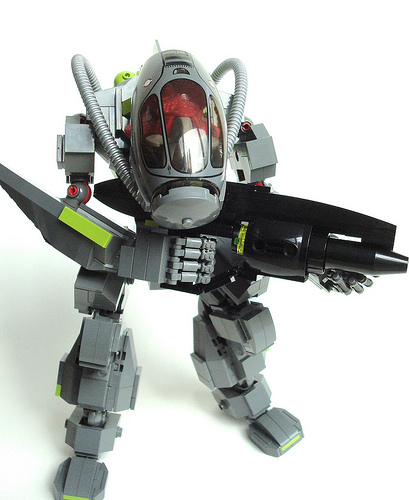 Surprisingly, many LEGO fans have never heard of the Ooni or of Galidor, LEGO’s failed action figure line and TV series from 2002. In my ongoing attempt to make Galidor cool, I give you the Ooni Brute. I envision him as a foot soldier of an invading alien army. His helmet assembly isn’t for breathing air, but for regulating internal body temperature because the Ooni are cold blooded. For a long time now, I wanted to do something with the Galidor head I had. 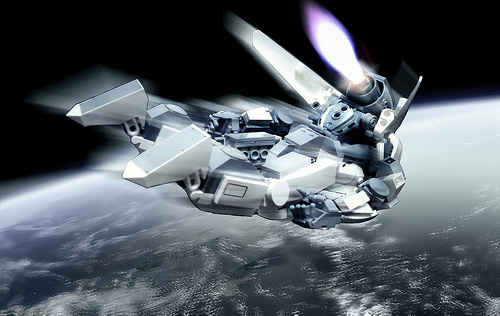 My idea was to build a mecha or hardsuit around it. The result: Daedalus Zero G Drop Suit. As it was taking shape, it started feeling like a version of a Buzz Lightyear Space Ranger. It features the domed helmet, retractable wings and jetpack, big res chest button, communicator on the right gauntlet and a laser on the left gauntlet.